Housing Perspectives (from the Harvard Joint Center for Housing Studies): How Much Did LTVs Actually Rise During the Housing Boom? How Much Did LTVs Actually Rise During the Housing Boom? The rise in housing prices that appears to be taking hold in many parts of the country is an important sign of recovery in the market. Among the many ways the upturn in prices is helping the housing market heal is by turning back the tide on the 100-year flood of underwater mortgages. Still, even as reports from CoreLogic and Zillow document the progress in reducing the inventory of homes with negative equity, these same reports remind us that despite recent improvements there are still millions of housing units saddled with mortgage debt exceeding the value of the home. These homes serve as a warning about the risks of excessive loan to value ratios (LTVs) that are assumed to have become commonplace among homeowners during the housing boom. However, a review of data from the Survey of Consumer Finances (SCF) from the last 20 years finds that there was actually relatively little change in the distribution of LTVs through the boom years. While outstanding mortgage debt did increase substantially, it essentially kept pace with the rise in home prices. The flood of underwater owners was thus less the result of a greater share of owners having little equity cushion and more the result of the tremendous collapse in housing prices. 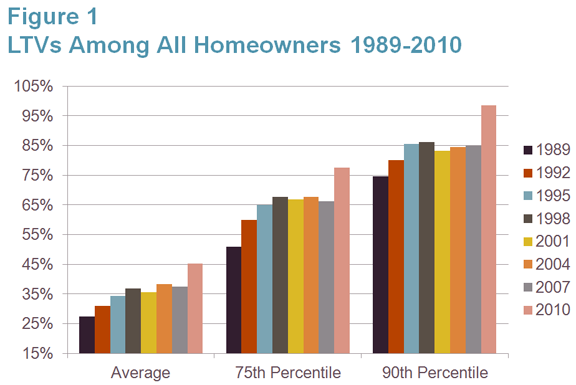 Figure 1 shows trends in the distribution of LTVs among all homeowners between 1989 and 2010, based on a comparison of total outstanding mortgage debt to owners’ estimates of the value of their principal residence. As shown, there was a fairly substantial increase in the average LTV between 1989 and 1995 from 27 percent to 34 percent. This rise reflects a combination of factors, including the greater tendency of households to hold mortgage debt in the wake of the 1986 Tax Act that gave preferential treatment to mortgage interest payments, the sharp fall in house prices in some areas of the country, and an expansion of mortgage lending that occurred as the economic boom of the 1990s began. However, between 1998 and 2007 the average remained largely unchanged at about 37 percent. Average mortgage debt did increase sharply over this period, from $67,000 to $111,000 (in constant 2010 dollars) but the average house value also increased substantially from $185,000 to $317,000. Even at the peak of the boom, the vast majority of owners still had fairly low LTVs. Source: Joint Center tabulations of Survey of Consumer Finances. 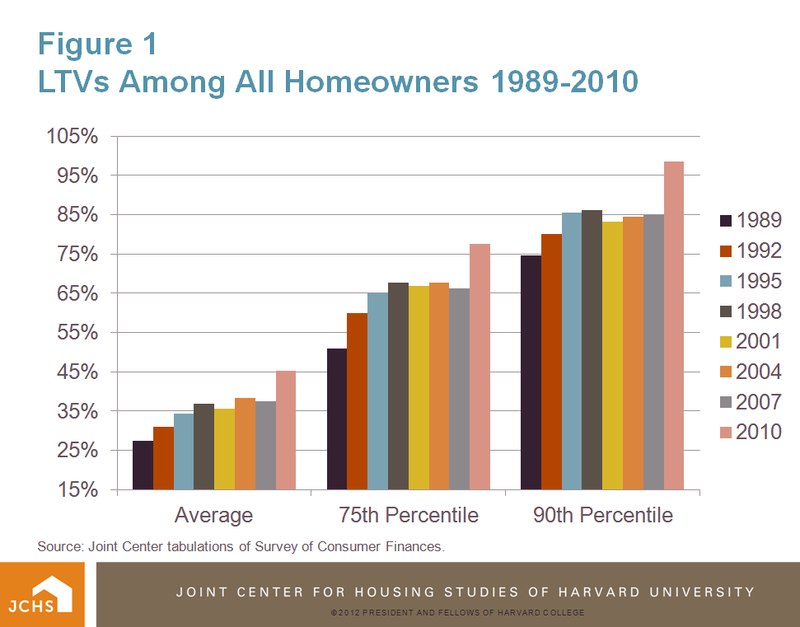 Of course, these averages include a large share of households that continued to hold little or no mortgage debt. The stable average may result from a rise in high LTVs among some owners that is counterbalanced by plunging LTVs for those who did not tap their growing home equity. But there was also little change in the level of LTVs at the upper end of the distribution. As Figure 1 illustrates, at the 75th percentile of owners LTVs also remained largely unchanged between 1998 and 2007 at roughly 67 percent. Even at the 90th percentile of the distribution LTVs held steady at 86 percent. Thus, even at the height of the housing boom the vast majority of homeowners had at least a 15 percent equity cushion, as they had continuously since the mid 1990s. 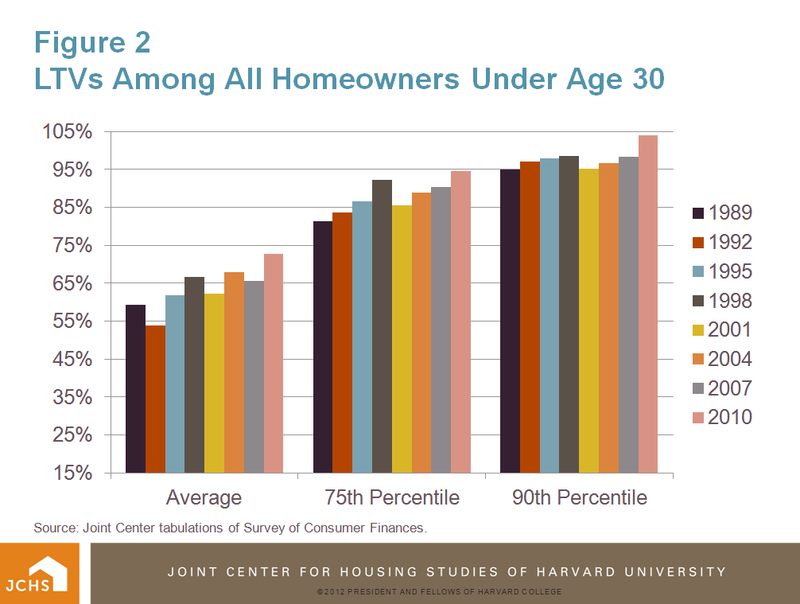 The data in Figure 1 includes homeowners of all ages, but it might be expected that highly leveraged homeownership was becoming more common among younger households who were more likely to buy homes during the boom years and take advantage of more liberal lending. 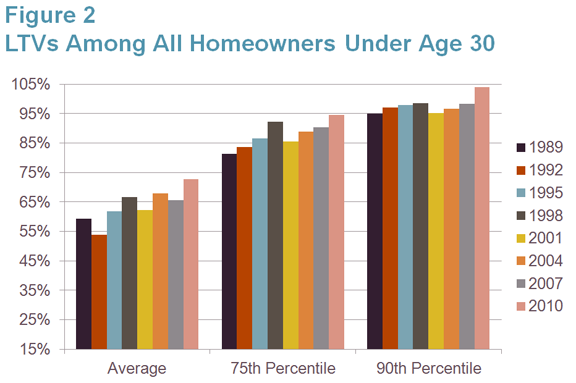 Figure 2 shows the same distributions of LTVs for homeowners under age 30. While there is more sampling variability for this subgroup, there does appear to be more of a rise in average LTVs among this group than is true of all households. Between 1995 and 2001 the average LTV was generally a little above 60 percent, but rose to more than 65 percent in 2004 and 2007. A similar increase was evident at the 75th percentile where LTVs reached about 90 percent during the boom years after having been closer to 85 percent during the 1990s. Still, the vast majority of young homeowners had at least 10 percent equity invested in their homes even when lending standards were most relaxed. There was more stability at the 90th percentile of the distribution, where young homeowners had LTVs of between 95 and 98 percent consistently since 1989. At this upper point of the distribution young homeowners did have little equity in their home, but this was no different during the boom than it was 20 years ago. As both Figures 1 and 2 illustrate, when the bottom fell out of the housing market after 2007 LTVs among homeowners shot up. According to estimates from the SCF, 9 percent of all homeowners were underwater on their principal residence as of 2010, with the rate more than twice as high among those under age 30. But this sharp rise in LTVs was the result of the unprecedented fall in house prices and not due to an expansion of excessively high LTVs during the boom. Still, there is no question that homeowners took on much more debt than was prudent during the boom. While outstanding mortgage debt may have been keeping pace with house prices, the level of debt was greatly outracing trends in incomes. This great expansion of credit decoupled from borrowers’ incomes certainly played a role in helping to inflate the housing bubble. The new Qualified Mortgage (QM) standard is designed to avoid this problem in the future by establishing an ability to pay standard for mortgage lending. Notably, the QM standard did not include restrictions on LTVs. However, the still to be announced rules defining the Qualified Residential Mortgage (QRM) may introduce limits on LTVs. While it is true that a greater equity cushion would have helped both homeowners and lenders avoid losses during the housing crash, the housing market has long been characterized by fairly high LTVs at the upper end of the distribution. These higher LTVs were not problematic as long as house prices were not subject to extreme swings. Imposing more stringent LTV requirements are of concern as they will curtail the ability of young households to get a start as homeowners—particularly the growing share of young minority households who have not benefited to the same degree from having parents build wealth through homeownership. Given these concerns, it may be best to have regulatory efforts focus on ensuring that borrowers can afford their mortgages as a means of introducing more stability in the mortgage system, rather than on setting standards for LTVs meant to withstand the next 100-year flood.